Confused??? The people in the governance deciding on behalf of maximum percentage of the nation’s population that is today’s youth speak a similar language! Not surprising that very few youth are seen as actively participating in matters of governance and society they live in. To debate on the participation of youth in democracy and governance, ComMutiny- The Youth Collective (CYC) and Pravah organized a panel discussion on a recently published book The Ocean in a Drop: Inside-Out Youth Leadership (Sage Publications, 2013) on youth-centric development. The event was scheduled on Friday, 26th April, 2013 at Casuarina Hall, India Habitat Centre, Lodhi Road, 6.30 – 8.30 PM. The panel discussion aimed at answering and discussing the when, what, who and how of the youth’s participation. Why some young people are fired with passion and others remain passive? Why some young people take responsibility and ownership while others are disinterested and detached? Why some young people are happy to stay in their comfort zone while others are willing to take risks? How can we systemically instill passion, ownership and risk taking abilities in young people? Is there a way we can create such a space? To ascertain the madness, to ask these and other such questions CYC & Pravah invited all the youth facilitators who work with young people to engage, explore and express their view to the event on April 26 2013. Ms. Ashraf Patel, co-founder, Pravah and ComMutiny-The Youth Collective (and one of the authors of the book). 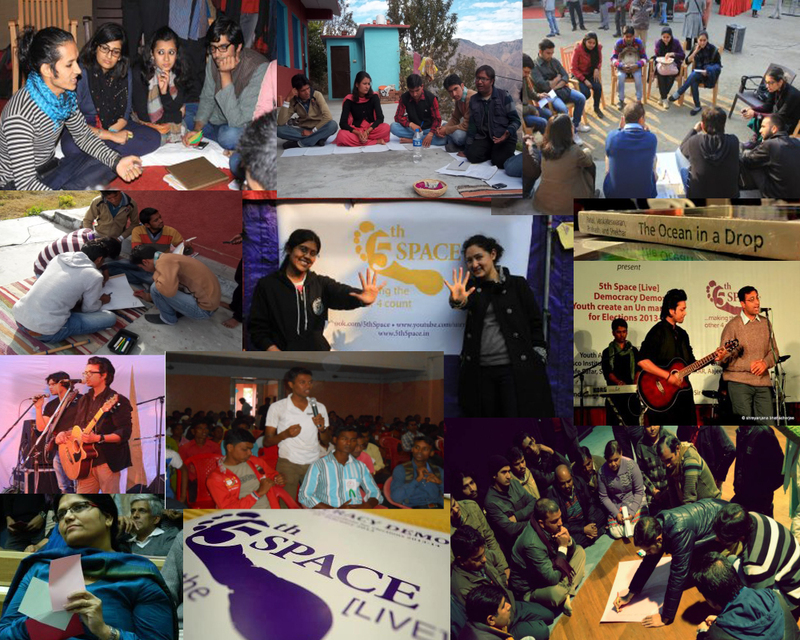 Commutiny Youth Collective and Pravah together shares credit for 5th Space concept. CYC in collaboration with different youth organizations have conducted 12 advocacy 5th Space LIVE events held across seven states over the last six months. The 5th Space LIVE finale event was held on 23rd February 2013 in Vishwa Yuvak Kendra, New Delhi hosted by ComMutiny- The Youth Collective (CYC) and Pravah in partnership with Youth Alliance. It brought together about 200 people from 30 organizations, a mix of youngsters and youth facilitators who sat down (quite literally) to discuss and analyze what democracy meant for them and where exactly they would like to see changes. Setting the context for the day, Arjun, co-founder CYC and Pravah, talked about how free are we to do/think anything and how we do not realize the kind of controlled environment we dwell in… that limits our freedom. Engaging the audience well he showed a short quirky animation, ’18 till I die’ which talked about the democracy and introduction of 5th space. 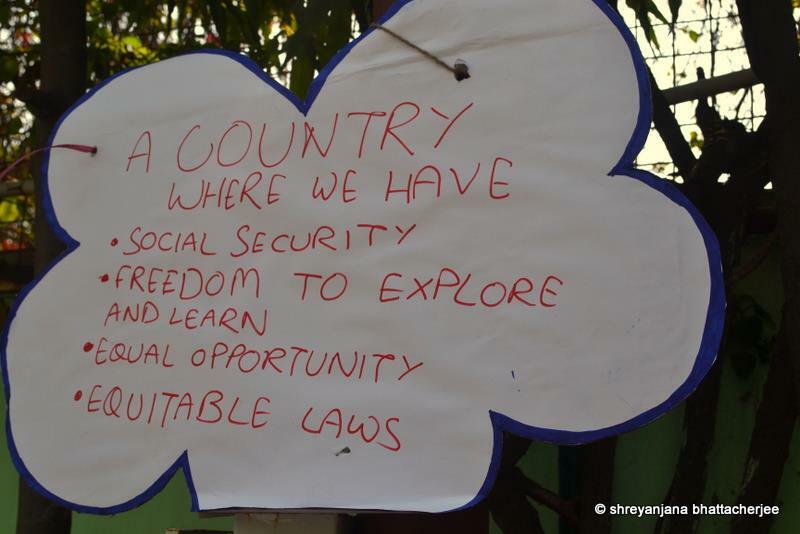 Participants penned down thought-provoking insights and their expectations from the future government in their respective vision clouds which were provided to them. The event witnessed many curious young minds talking and sharing about their participation in the governance and their visions. This event also marked the launch of the book, ‘Ocean in a Drop’. The authors of the book Ashraf Patel, Meenu Venkateshwaran, Kamini Prakash, Arjun Shekhar, along with Mr. R Chandra Sekhar from Sage Publications and Mr. Avinash from Oxfam India released the book. A dance performance interpreting and illuminating the core of the 5th space followed by a live band performance by Ekam Satyam with lyrics further added to the audience’s understanding of 5th space. The participative dialogues on democracy, film screening and creation of the ’un-manifesto’ energized the whole space and making it a true 5th space.